The human race created money and finance: then, our inventions recreated us. 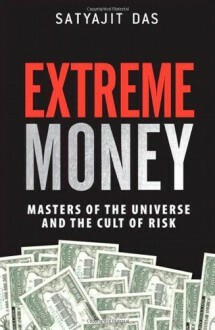 In Extreme Money, best-selling author and global finance expert Satyajit Das tells how this happened and what it means. Das reveals the spectacular, dangerous money games that are generating increasingly massive bubbles of fake growth, prosperity, and wealth--while endangering the jobs, possessions, and futures of virtually everyone outside finance. "...virtually in a category of its own — part history, part book of financial quotations, part cautionary tale, part textbook. It contains some of the clearest charts about risk transfer you will find anywhere. ...Others have laid out the dire consequences of financialisation ("the conversion of everything into monetary form", in Das’s phrase), but few have done it with a wider or more entertaining range of references...[Extreme Money] does... reach an important, if worrying, conclusion: financialisation may be too deep-rooted to be torn out. As Das puts it — characteristically borrowing a line from a movie, Inception — "the hardest virus to kill is an idea". -Andrew Hill "Eclectic Guide to the Excesses of the Crisis" Financial Times (August 17, 2011) Extreme Money named to the longlist for the 2011 FT and Goldman Sachs Business Book of the Year award.